What would the economic impact be on La Liga if Barcelona left? The real possibility of Catalonia becoming an independent state has led to a number of threats about the consequences it could have in many different sectors. Football is one of those sectors. La Liga (LFP) chief Javier Tebas said a few days ago that in the event of secession, the league would work without Barcelona or any other Catalan club. However, the LFP president did not mention the serious impact that would have on the league economically, given they would be kicking out the second richest team in the world (Forbes valued Barça at 3.25 billion euros) and removing the Clasico, the world's biggest domestic game. You have to keep in mind that in Spain, football has a direct impact of 0.69 percent on the economy's Producto Interior Bruto (PIB). According to a study by Sports Business Institute, Real Madrid and Barcelona's income in 2016 was more than 0.11 percent of the PIB, which 1.11 euro for every 1,000 euros produced by the country's economy. 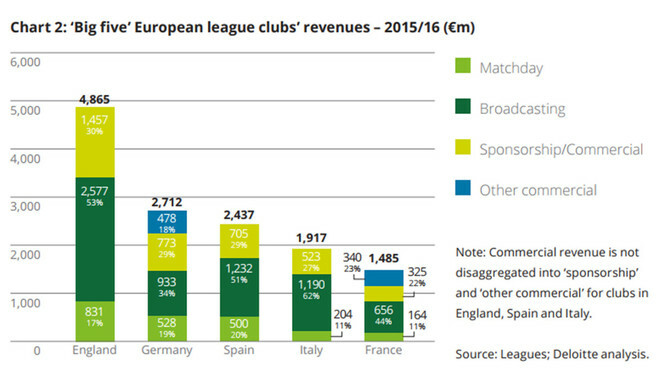 Deloitte, in their most recent Annual Review of Football Finance, compare the five biggest leagues in Europe in terms of income. Spain is third in the ranking at 2.437 billion euros, half of which comes from Barça and Madrid (1.382 billion euros). In fact, Barça closed the 2016-17 season with revenue worth 708 million euros (before the sale of Neymar). It is complicated to imagine that any league in the world would want to lose the luxury of a game like the Clasico. Working out its global impact is not easy, given beyond the revenue it generates in ticket sales and television rights, it's a game which even affects the habits of families. In any case, the two games (minimum) which Barça and Madrid play each season have huge audiences which generate huge sums of money in television rights and sponsorship for La Liga which is shared among all the clubs. The friendly Clasico played in Miami in August had more than 200 million spectators. It is precisely these figures which guarantee the revenue in terms of television rights of the two teams. Javier Tebas, the highest representative of La Liga, didn't like the fact that Barcelona were in favour of the referendum on Catalan independence and made it known through several public threats. However, he forgot to add that in the case of Barça being left out of the Spanish League, the competition he runs would also suffer a collapse of huge magnitude. Where will Barça, Espanyol and Girona play if Catalonia becomes independent?